The changes on Route 111 and Interstate 93 in Windham NH have totally transformed the area which was composed of Dinsmoor Hill and Indian Rock Road. At the turn of the twentieth century, this scenic country road traversed some incredibly beautiful scenery. Beginning at it’s intersection with Range Road, Indian Rock Road, where the Morrison family homestead once stood, it began a decent toward Cobbett’s Pond in the Valley below. Along the way, this scenic road passed hills, farms and the shores of a truly panoramic lakes-shore view. Much of the land along the road was part of the Dinsmore Family farm. The biggest change along Indian Rock Road, at the beginning of the twentieth century, was the construction of Searles Castle. Ponds were dug, walls were built and the castle itself could be seen rising on the distant hillside. The main feature a traveler along the road would have noticed would have been the gate-house that was built right on the road. At this time , the road passed behind where Citizens Bank is located today. 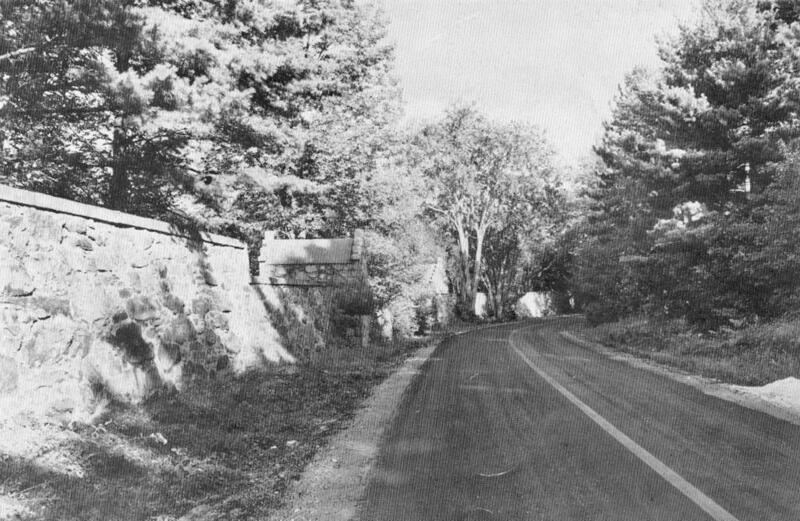 The road was moved when Route 111 was reconstructed by the state of NH in the 1950’s. Continuing along Indian Rock Road, you would have come to the John H. Dinsmore farm. The road actually ran between the barn an the house, where the horse and carriage are shown in the photograph above. When Route 111 was rebuilt in the 1950’s this stretch of Indian Rock Road became Wyman Road where the Windham Exxon was located. Today the southbound exit ramps pass just about where the house was located. The road shown veering to the right was county road which was a straight shot to Windham Depot. When Interstate 93 was built it was discontinued except on one end, but it could still be seen, making its way in the median strip of the highway, before the most recent construction. John Dinsmore’s land ran to Cobbett’s Pond and his son George Dinsmore Sr. built a stone house on Indian Rock Road, past the farm, when he returned from Wyoming. He built the house himself, with his own hands. Across the street from the house he built a barn. The road was still dirt at the time. There would have been glimpses of the pond from the road but it would have really come into view at Dinsmore Ravine. Today you can still see it from the road near Rocky Ridge Road. George Dinsmore Sr. built the stone house and was know for his tall tales. George Dinsmore Sr., loved to tell tall tales and his favorite character was his heroic grandmother. According to his account, the brook that crossed Indian Rock Road, near his house, was known as “Scalding Brook.” There was a reason for this rather peculiar name. Back when Mr. Dinmore’s grandmother, was in her prime, she was quite the woods-woman. The men who cleared trees in Windham had nothing on her. She would cut down massive trees and chopped wood at such an incredible rate of speed, that her double sided axes would glow red hot. The reason why the brook was called “Scalding Brook” was because Grandmother always had several red hot axes cooling in the water of the brook. In fact, the water in the brook boiled red hot constantly from the axes and the towns-people would bring their pigs there to boil the hides. Mr. Dinsmore’s grandmother would be what you would call an emancipated woman and her strength made her a legend in Windham, as well as in surrounding towns. In fact, she lived to be 104 years of age, but sadly died in child birth while digging a well. She passed away thirty feet below ground. When Grandmother was in her prime, there used to be competitions in Windham to see who could plow the most field with a team of horses. The men did their best to beat Mrs. Dinsmore but she had a maneuver that none of them could match, and for this reason, she always won the competition. When the men and their teams would reach the end of a row, they would have to take the time to get their horses turned around. Grandmother didn’t have this problem, because of her great strength, she just picked her team of horses up over her head and turned them in the row. In this manner, she always won. And of course, Mrs. Dinsmore was quite the watermelon farmer. She grew championship watermelons that were almost as big as a small houses. She grew these on Dinsmore Hill, high above the valley below. They grew so mammoth that she had to prop them up with large planks of wood. One day, she was on the hillside, hoeing weeds around her melons, when she accidentally hit one of the boards holding them in place. All of a sudden, there was a tremendous roar, as the first one, then all of the giant watermelons became dislodged and began to roll down the hill toward the valley, carrying Grandmother along with them. The poor lady would have surely drowned but she was able to grab onto a giant watermelon seed and survive. That is how Cobbett’s Pond came to be. As a great story-teller, George Dinsmore Sr., would have added more details and feigned sincerity, in order to take his listeners in, but you get the idea. The pictures show George Dinsmore Sr. and the stone house that he built by hand, early in the twentieth century. Many of you, will remember the barn that sat across the street. At left, my great-grandmother is standing in front of the stone house. Behind her, Indian Rock Road, passes over “Scalding Brook,” with John H. Dinsmore’s barn in the background. Of course, the rock shown behind her, was once located near Indian Rock. It was the chief’s chair and he used to sit in it while the members of his tribe ground corn. Grandmother, carried the stone chair on her back, and placed it where it still sits today, in front of my grandfather’s house on Indian Rock Road. “In early days the Indians used to encamp on the shores of Cobbett’s’ and Policy Ponds, and many arrowheads have been found as they were turned up by plows near the shore…” I was told that there was a large agricultural settlement located in Windham, between Cobbett’s Pond and Canobie Lake. Native Americans did in fact have large settlements and open agricultural fields. Of course, the Indian grinding holes, on “Indian Rock,” prove that corn was grown by the Indians in the area. Back when Cobbett’s Pond Road was rebuilt by the state of New Hampshire, a great number of Native American implements and tools were found in the there. So that is why there is a memorial plaque on Indian Rock. It is there to remember a forgotten people, who once lived nobly and in harmony with nature. It allows us to picture in our minds, these people sitting upon this rock, grinding their corn, as they looked out through the ravine to the shores of Cobbett’s Pond. Before Route 111 was rebuilt in the 1950’s, Indian Rock was visible from the road. Continuing along Indian Rock Road was the Harris Homestead which was built by the Rev. Samuel Harris in 1811. He was a beloved pastor at the Windham Presbyterian Church. His son, William Harris wrote a “Windham” column for the Exeter Newsletter from 188o though 1917. His columns and interest in Windham History have preserved much of what we know about Windham’s past. Beginning in the late 1800’s, William Harris began a summer resort on the North Shore of Cobbett’s Pond, building several cottages and renting them out to summer tourists, by the week and month. 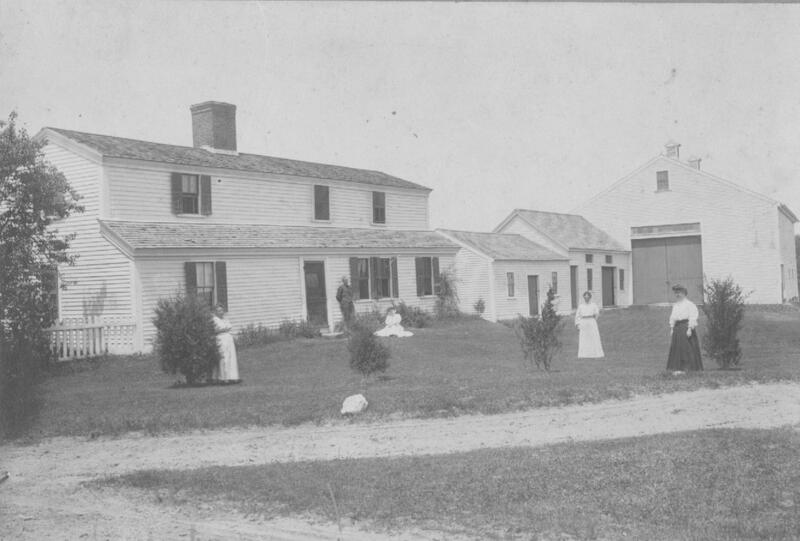 The Harris Homestead was located where Windham Village Green is today. The final section of Indian Rock Road was laid out much differently than it is today. When Route 111 was widened and straightened in the 1950’s, it was also rerouted to bypass the Center of town. Today, this bypassed section of Route 111, runs from about where “Windham Commons” is today to the current intersection with North Lowell Road. Prior to the 1950’s, Indian Rock Road, ran along what is Church Street today. It ended right in front of the Presbyterian Church, where it intersected with Lowell Road. Yes, Lowell Road, because before the bypass of the Center, there was no Lowell and North Lowell Roads, there was just Lowell Road. 1) The view looking from where the “Village Green” is today toward the “Center.” 2) The current location of the plaza where Klemm’s Bakery is located. 3) The site of “The Commons,” the wall is still there. 4) Indian Rock Road before it became Church Road. 5) Indian Rock Road running in front of the Windham Presbyterian Church. 6) The intersection of Indian Rock Road and Lowell Road. I hope you enjoyed this look back at Indian Rock Road. Within a couple of years, you will never be able to imagine that it could have looked as it did and you will also have forgotten how it looked just 10 years ago. This entry was posted in Cobbett's Pond, Dinsmore Family, Windham History and tagged Cobbett's Pond, Indian Rock, Indian Rock Road, John Dinsmore. Bookmark the permalink. I loved seeing Cobbett’s just a few years before I experienced it. Thank h=you for keeping the photos and momories! I was six years old from Nashua when my family first rented a cottage at Cobbett’s mext to the oulet dam. That was 1946. We rented the Kinney and Jeane cottages until the early 1960’s/ So many great memories of Bud’s Corner, Sunday ballgames on the field in back of the Kinney’s, always great swimming water, pokeno games at Community Beach, the Cobbett’s Pond Boat Parades, Cushman Bakery trucks, Thursday nights at Canobie Lake Park, seeing racing boats go across the lake at 40 MPH along with the rowboats with motors, Horn’s Point where we thought we were great fisherman when we caught Kibbies., I had a slower racing boat at Cobbett’s in the early 50’s and loved to just go around the pond by myself using my dead man’s throtle at about 25 MPH. No gas on the pond,so my mom took me to the gas station around the corner toward Lowell to fill it up and add the oil. I have a movie of the boat parade as it came by our cove circa 1953, if anyone is interested. I loved our summers there and have keep those memories close to my heart ever since! When raising our family, my wife and I, and our four children spent a vacation at one of the same Kinney cottages my mom, dad and family had rented over the years. What a treat!I Have many more memories to share,as I am sure have many others. No place like it! That was a special time and place, indeed! Question: Is Pine Terrace the area your pictures show being near the dam? I remember the Taymore’s and Jackie Taymore’s boat next door to our cottages. Is that what you are referring to as “Pine Terrace?” I remember a friend named Arthur who lived in that colony and whose family had a powerful outboard boat and he took us for a ride in it. Thank you again for sharing your photos and memories!